This has got to be one of the cutest ideas I have seen in a long time! These adorable little things are utensils from Constructive Eating. Constructive Eating came about when two parents, pondering on their son's love of construction vehicles and all things related, wondered what would happen if they brought that fun to the dinner table.. The answer is these fun utensils that make eating so much more entertaining! 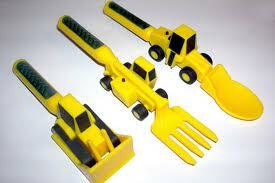 There is the "fork lift" fork, the "front loader" spoon, and the "bulldozer" pusher. 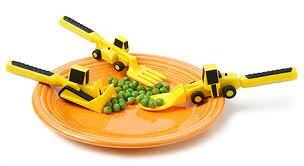 Kids can use the pusher to help get their food onto their fork or spoon. You already know I think these are great! Tater is such a picky eater, and usually just eats a few bites before he's done. But when we brought out the Constructive Eating utensils, he wanted to sit and sit and sit at the table. He really didn't even pay attention to what he was eating, he just wanted to use the cool stuff to eat it! He actually ate green beans, because he was so busy playing with the pusher and fork that he didn't even care what he was putting in his mouth! Love It! I now have to wash these dishes before every meal so that he will have them to eat off of! I can't complain though, at least he's eating! To get some awesome Constructive Eating products of your own, click here!